I found this recipe in the November, 2010 issue of Better Homes and Gardens. This recipe by Susan Asanovic won the Easy Appetizer Challenge. 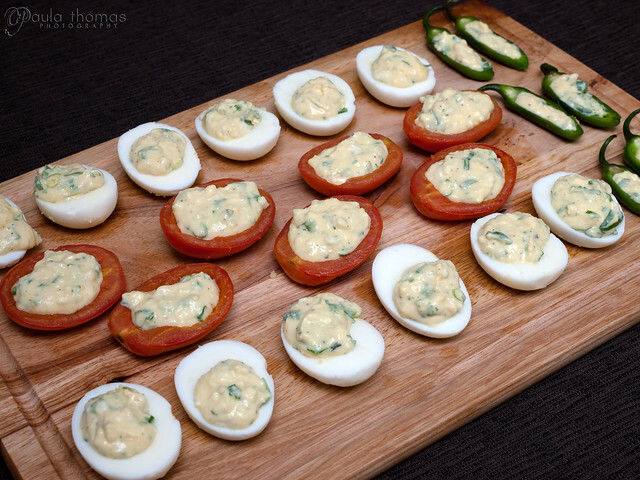 It puts a ranch flavored twist on the traditional deviled egg. 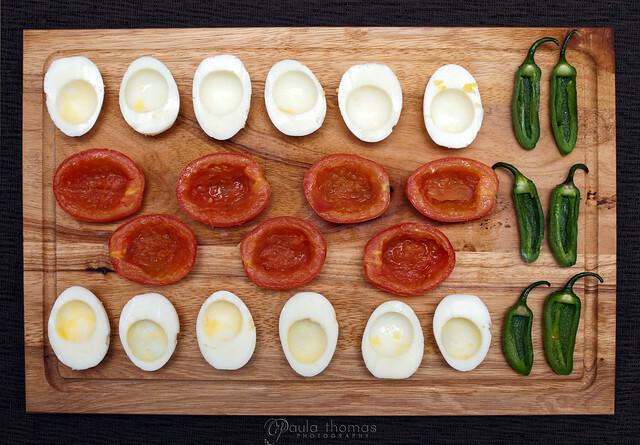 Have you ever made deviled eggs and not had enough filling to fill all the eggs? I know I have. This recipe has you add 4 of the egg white halves to the filling. I never even thought of doing that before, but it's a great idea and it worked well. There was plenty of filling left to also fill some tomato and jalapeno pepper halves. This recipe called for fresh tomatoes but I decided to roast mine in the oven for a little while before filling and they were my favorite of the three. I think the ranch dressing was a little too strong for my taste and I didn't even put the entire packet in the filling. I think half of a packet would probably be enough. I thought it was a fun recipe though and liked using the filling in the other vegetables. You can also find a printable recipe here. 1. Coat a small skillet with vegetable oil; heat over medium heat. Cook peppers for 5 minute, turning occasionally, until lightly charred. Cool. 2. Halve peppers; remove seeds and membranes. Scoop out tomato halves. Set halves aside. 3. Remove yolks from eggs and place in a medium bowl. Add 4 of the egg white halves to bowl; mash with a fork. Stir in yogurt, cilantro, green onions, dressing mix, and oil. 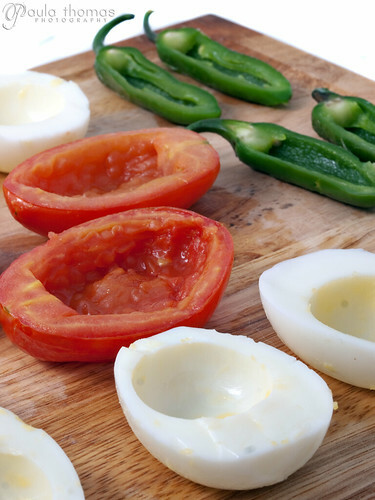 Spoon mixture into halved jalapeno, tomatoes, and egg whites. 4. Cover and chill up to 8 hours. Top with olive slices, if you like. Makes 14 (2-appetizer) servings.